Resin inspired waves, fins and oceanscapes make Vince Broglio’s work some of the most appropriate for a community like Santa Cruz. It is fun to think that this artwork may have started as a happy accident, and it could also be fun to think of it as a very specific mission to master resin. In reality we know that all art is some combination of happy accident and dedicated process, and we know lots of Vince Broglio’s fans will agree. Today’s featured artist is the unique Vince Broglio, who makes his work out of surfboard resin in Santa Cruz! 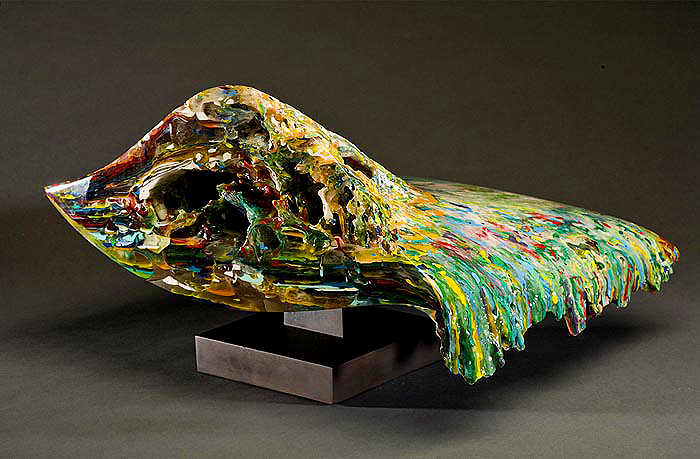 All of this work is made from the recycled resin and fiberglass materials used in Vince’s surfboard glassing business. Check out more of Vince’s work here.